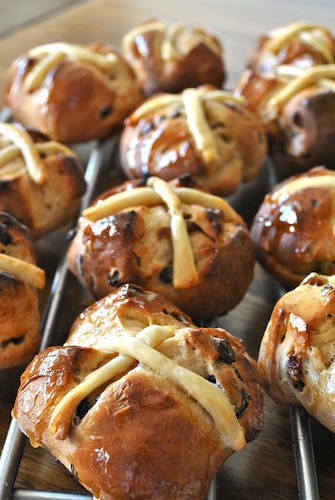 Today is Good Friday and a traditional favorite in England is Hot Cross Buns. 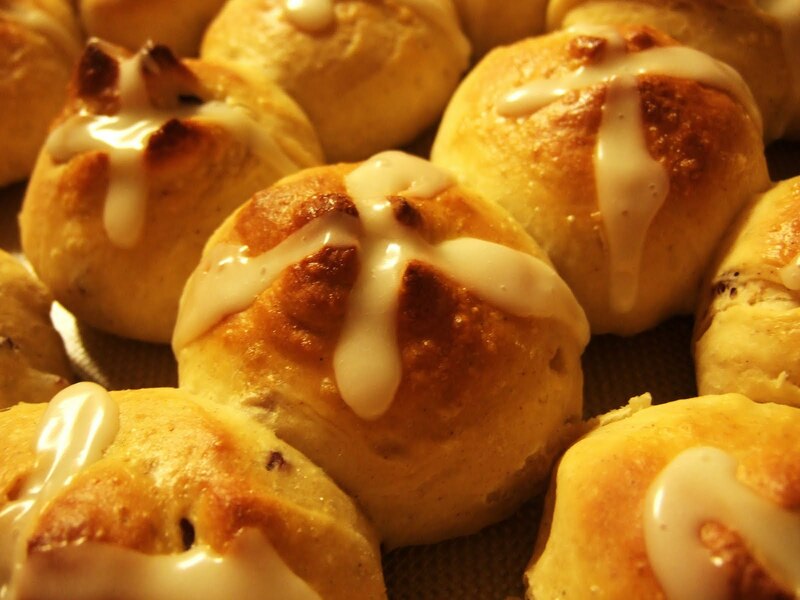 These are a spicy currant or raisin studded yeast bun, topped with a “Cross” of lemon flavored icing. While Christians have adopted the cake and the symbolism of the cross, it wasn’t always so. To Pagans then as now, the cross was symbolic of the sun wheel, which symbolizes perfect balance at the time of the Spring Equinox. Hot Cross Buns were originally used in ceremonies and rituals and the Christian Church attempted to ban the buns, although they proved too popular. Left with no alternative but defeat, the church did the next best thing and “Christianized” the bread with Queen Elizabeth I passing a law which limited the bun’s consumption to proper religious ceremonies, such as Christmas, Easter or funerals. Hot cross buns! Hot cross buns! One a penny, two a penny,? If you have no daughters,? Give them to your sons,? A vendor selling Hot Cross Buns on Good Friday. Probably singing the song noted above. In a small saucepan, heat milk to very warm, but not hot (45°C if using a candy thermometer). Fit an electric mixer with a dough hook. Pour warm milk in the bowl of mixer and sprinkle yeast over. Mix to dissolve and let sit for 5 minutes. With mixer running at low speed, add sugar, salt, butter, cinnamon, nutmeg and eggs. Gradually add flour, dough will be wet and sticky, and continue kneading with dough hook until smooth, about 5 minutes. Detach bowl, cover with plastic wrap and let the dough “rest” for 30-45 minutes. Return bowl to mixer and knead until smooth and elastic, for about 3 more minutes. Add currants or raisins and knead until well mixed. At this point, dough will still be fairly wet and sticky. Shape dough in a ball, place in a buttered dish, cover with plastic wrap and let rise overnight in the refrigerator (see note at right if you’re in a hurry). Excess moisture will be absorbed by the morning. Let dough sit at room temperature for about a half-hour. Line a large baking pan (or pans) with parchment paper (you could also lightly grease a baking pan, but parchment works better). Divide dough into 24 equal pieces (in half, half again, etc., etc.). Shape each portion into a ball and place on baking sheet, about 1/2 inch apart. Cover with a clean kitchen towel and let rise in a warm, draft-free place until doubled in size, about 1 1/2 hours. In the meantime, pre-heat oven to 200° C.
When buns have risen, take a sharp or serrated knife and carefully slash buns with a cross. Brush them with egg white and place in oven. Bake for 10 minutes, then reduce heat to 175° C, then bake until golden brown, about 15 minutes more. Transfer to a wire rack. Whisk together glaze ingredients, and spoon over buns in a cross pattern. Serve warm, if possible. I’ve always enjoyed hot cross buns, which were traditionally made with candied fruit. The candied fruit was often rather petrified, except when my sister would make her own out of grapefruit or orange peel, in which case it was wonderful. My husband and children never liked candied fruit (it must be a British thing, so I’d leave it out, as does this recipe. Also I’d never heard of the cross being made with lemon icing – we always had plain vanilla. Lemon is a great idea! My Catholic mother-in-law in New Jersey HATED hot cross buns. During Ash Wednesday and Good Friday, that was the only thing her mother would let the family eat, and as a child she preferred to starve those days. However when I made them without the candied fruit, even she liked them. What a great family tale! Your poor mom-in-law. I suppose anything can become an aversion if forced to eat it exclusively. Maybe I should try that with chocolate. LOL! Thanks for the lesson, Sharon. Hot cross buns have been a part of my Easter since I was a little girl! Thanks, Sharon, for this very interesting post! Always wondered what was the meaning behind the ‘girls first’ and ‘if you have no daughters, give them to your sons’. Did you come across anything about this? Joana, Sorry for the delay in reply. I had to do some checking. Alas, I could find nothing on that line. The song — originally a nursery rhyme — dates from the 19th century with the “Hot Cross Buns!” line a commonly heard shout by the street sellers to attract customers. I can only assume that the girls first is simply a gentlemanly consideration. Good question though! Very interesting. “Sun wheel buns” for spring equinox. Thank you for the bit of history! I’ve never had hot cross buns, but they look amazing. I may have to look into that. Hmmmm, very interesting stuff. It never ceases to amaze me how someone would try to limit something as inconsequential as how much people ate a piece of bread. Once again the history lesson is amazing Sharon! I’ve actually never eaten one. Maybe I’ll try the recipe this year! Save yourself the time, and find a good bakery, Sharon. I remember buying them from La Parisian in Hanford(aka ‘The French Bakery’). We had them for our family Easter Sunrise Service, at home. We did this for several years with the girls. If made correctly the Hot Cross Buns are ‘nice’ – in Belize this means ‘tasty’!